Posted on 15, April 2019 by EuropaWire PR Editors | This entry was posted in Banks, Financial, France, Insurance, News, Slovenia and tagged acquisition, COFACE, credit insurance, Declan Daly, Sergej Simoniti, Sibil Silvan, SID - PKZ, SID Bank, Slovenia, Xavier Durand. Bookmark the permalink. Bois-Colombes, France, 15-Apr-2019 — /EuropaWire/ — Coface supports its strategy of profitable growth in Central & Eastern Europe region with the acquisition of SID – PKZ, the market leader in credit insurance in Slovenia with a high market share. The business will operate under the new brand name Coface PKZ. SID – PKZ was founded by SID Bank in 2005. It has recorded EUR 14.3 m of gross written premium in 2018. The transaction will have a neutral impact on Coface’s solvency ratio. Coface strengthens its market position in the Adriatic region with this strategic step. Coface will enhance the support of Slovenian exporters with its broad range of services and a vast international network. Adding value to its clients and contributing to the economic development of the country. Coface PKZ will be integrated into the Central and Eastern Europe region under the leadership of regional CEO Declan Daly. “The acquisition of SID – PKZ marks the first external growth initiative of Coface in more than 10 years. It will reinforce our presence in this important part of the world and it is perfectly in line with the objectives of our Fit to Win strategic plan. 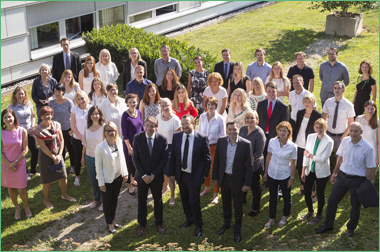 Through this acquisition, Coface is proud to contribute to enhancing the Slovenian Economy and excited to welcome a very experienced and highly recognised team of 74 experts from SID – PKZ” comments, Xavier Durand, CEO of Coface. “We believe that the new strategic owner of SID – PKZ can provide opportunities for development and for a further expansion of the company´s operations. This will enable SID – PKZ to access a wider spectrum of foreign markets, which will undoubtedly help the Slovenian economy. This will also have a positive impact on a more competitive insurance and reinsurance of non-marketable risks, which we will continue to implement in SID Bank. We believe that this will further stimulate Slovenian exports and sustainable economic development in Slovenia” comments Sibil Silvan, President of the Board of SID Bank, at the conclusion of the sales process. “We are delighted to become part of the Coface family. As part of SID Bank group, we have served the Slovenian economy in its expansion for the past 27 years. We are very proud that Coface has acknowledged our achievements and recognised our value. We are convinced that being part of Coface group will enable us to offer our clients an even better service. We believe that together with Coface we will strengthen our position as market leader and trade credit insurer of choice in the Adriatic region” comments, Sergej Simoniti, President of the Management Board SID – PKZ.